Sarah and Mark Duggan with their dog, Darby. 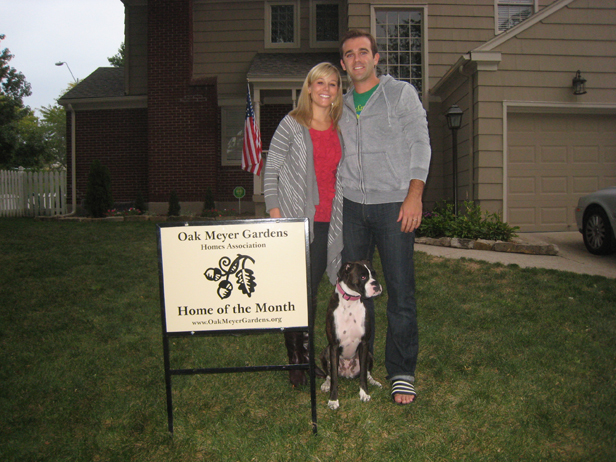 The Home of the Month award for September, 2011 was recently presented to Mark and Sarah Duggan at 6701 Rockhill Road. The Home of the Month award is presented to Oak Meyer Gardens residents who take exceptional pride in the outward appearance of their home and property. In addition to being recognized for their efforts, Mark and Sarah were presented with a $25 gift card donated by our award sponsor, Euston’s Waldo Hardware, located at 126 W. 75th St.
Do you have a neighbor who deserves the Home of the Month award? Nominate them by sending a note through our website contact form. Be sure to include your neighbor’s name and address. I noticed their new exterior paint at the corner of Holmes and Rockhill – looks great! Such a nice fenced yard too, and the cutest boxer pup. Congrats, neighbors – well deserved. pretty and neat. I love the way Darby is posed. Congrats!! !